Another basket-handle arch bridge, but this one makes a pretty picture. The photo's in color, but the smog has reduced the spectrum to shades of gray. The Nakajima-Gawa Bridge carries traffic on the Wangan Expressway along with the Kanzaki-Gawa Bridge (another basket-handle arch) across the mouth of the Yodo River in Osaka Bay. Like the other Wangan arch bridges, this structure is recognizable by its distinctly shaped piers. The span length for the Nakajima-Gawa Bridge is 160 m and the width is 27.3 m. The piers are supported on steel pipe piles. 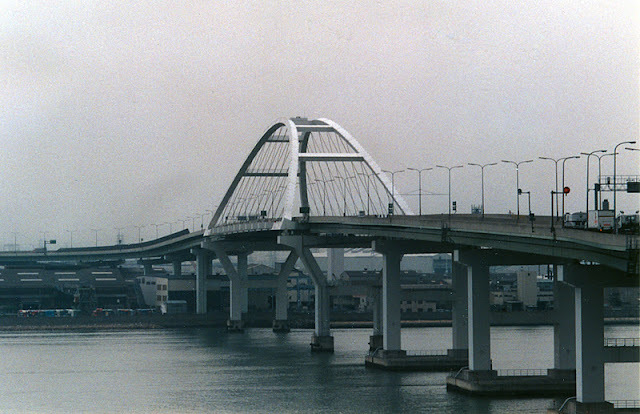 The Hanshin Expressway Public Corporation had both bridges built in 1991 at a total cost of 8 billion yen. The superstructure was lifted by floating cranes and placed onto the piers. Because the Wangan Expressway is wide, the steel deck had to be designed to prevent buckling due to the bending compressive stress in the transverse direction. Osaka Bay Bridges: Nakajima-Gawa Bridge by Mark Yashinsky is licensed under a Creative Commons Attribution-NonCommercial-ShareAlike 3.0 United States License. What a great blog! Love the basket handle bridges and the different bridge colors. I think turquoise is a fine bridge color - we try and color our bridges to match the environment but could really make them more special. I need to start a "fault of the day" page!